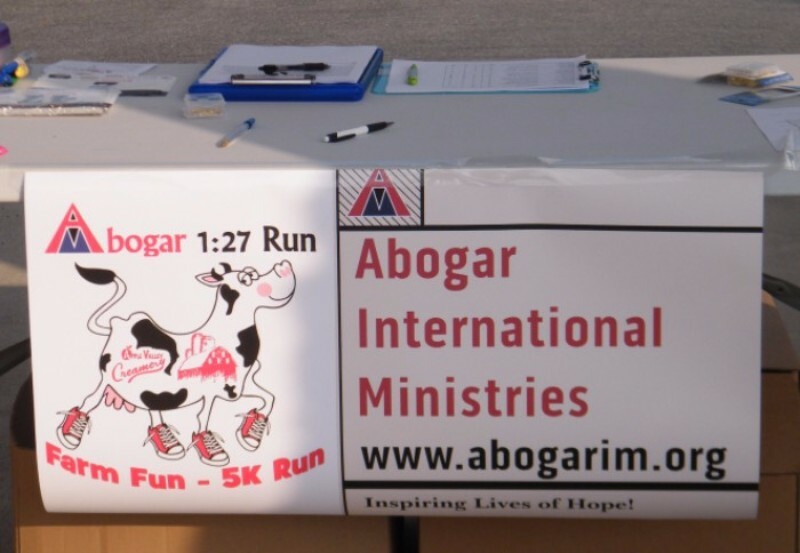 Abogar International Ministries is a 501(c)3 tax-exempt nonprofit organization that focuses on advocating for and ministering to children of Latin America who are orphaned, abandoned, and/or homeless. We fight for these children to have Christ-centered homes, family, and education. January 7-10: Abogar's 2016 Annual Board Retreat in Riverside, CA. January 21: Jesse Rivers speaks to youth at a Christian Tourism School to motivate and encourage them in their faith. January 22: Jesse meets with the lawyer of another Christian organization in Guatemala to learn how Abogar can move forward in Guatemala. 1. The children in need in Latin America: for their salvation, community, health, education, basic needs, and safety. 2. 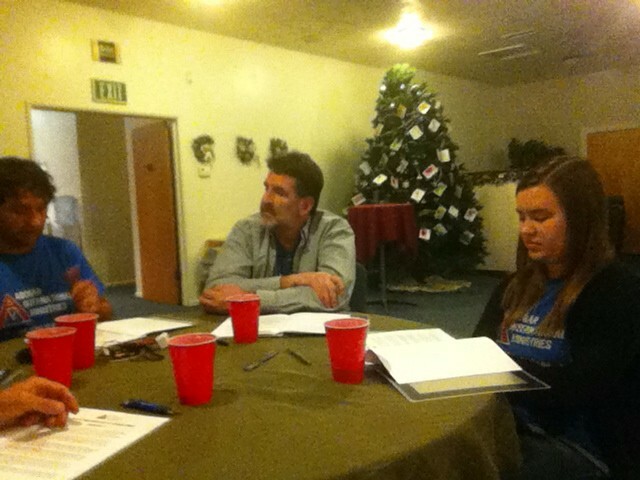 Discernment and favor in choosing a National Director for Guatemala, who we hope to hire in the next few months. 4. The staff and workers at Casa Bernabé; and their ministry to serve children in need near Guatemala City. 5. For God Bless The Children Home... for the workers, children, and house parents to be blessed and be drawn closer to God. 6. For Paradise Bound Ministries to continue having the amazing impact in lives of children and communities in and all around Chimaltenango! 7. For InnerCHANGE Xela, to continue to effectively reach out to children who are living in the streets and need God's love and role models to lead and bless them! 8. For continuing connections and opportunities to network and partner with other organizations and ministries in Guatemala. In 2016 Abogar has begun a Capital Campaign! We sense God's leading and prompting for us to begin raising funds specifically for a piece of property and/or building for Abogar Guatemala to be able to provide homes and family for precious children there. Our goal for 2016 is to raise $50,000. Please prayerfully consider if God is inviting you to invest in our Capital Campaign. 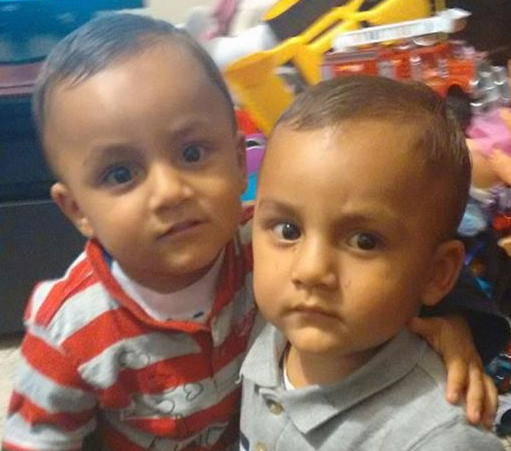 Funds can be donated here. Please be sure to specify that your designation is for the Capital Campaign! It's hard to believe that January has already come and gone! It was a month full of blessing and direction for Abogar, and we are filled with gratitude and appreciation to God for where and how He is leading us to move Abogar forward! In our Annual Board Retreat, at the beginning of January, the Directors enjoyed a time of unity building, vision casting, and direction setting for Abogar in 2016. With great insights, wisdom, and input from everyone, we have been able to establish our 2016 budget, Capital Campaign goal, and this year's goals and direction. We were able to dream together for upcoming years as well. After the Board Retreat I have returned here to Guatemala; where I have been fostering some important relationships, prayerfully discerning how to move forward to install a National Director for Abogar Guatemala, and seeking out some new connections and potential networking people and places to further the outreach and ministry of Abogar. I also have been taking some Spanish classes to improve my level of communication. Needless to say, it has been a busy month. We sense that God has some great things that He wants to accomplish in and through Abogar this year. We invite each of you to join us in prayer for clarity and confidence in all that He calls us to; that we may be able to see more children of Latin America have Christ-centered homes, family, and education in 2016! For your continued prayer and financial support, I personally thank you from the fullness of my heart! For more information to connect with us, please email us at info@abogarim.org. If you want to join our team of donors with a one time gift or monthly commitment, visit www.abogarim.org/support to see what the best option for you will be to make the donation! 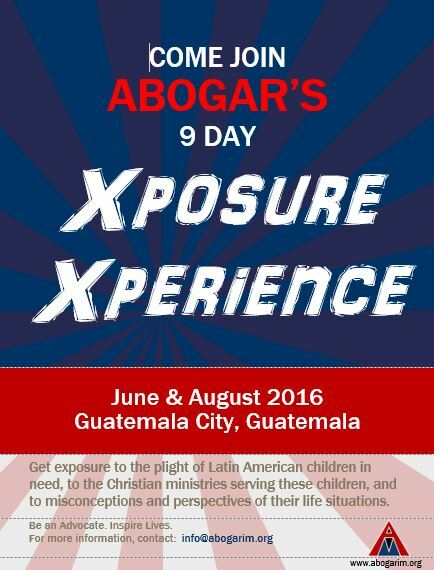 We'd love to hear from you about your interest and/or questions about an Xposure Xperience trip! Contact us at info@abogarim.org. 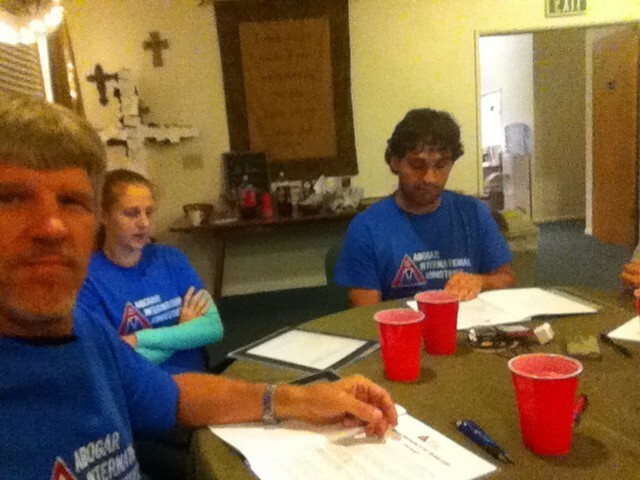 The year started with a successful fourth annual Abogar Board Retreat! It was a great time of fellowship, collaboration and decision-making that has set 2016 off with a vision of "moving forward," which is a word of faith that was spoken by one of our very own board members (Laura Stoner) during the retreat. We trust that the Lord has used the last four years to ground us and prepare us for what is to come in 2016. During the Year-end President's Report, we were blessed by the presence and participation of five of our financial and prayer supporters. They have been and continue to be a great encouragement to us, along with so many of our regular prayer and financial supporters. We also had the honor of having the President of CAFO (Christian Alliance for Orphans), Jedd Medefind, spend some time providing us with excellent counsel in how the board can improve in it's purpose of helping steer Abogar in the direction that God is leading it. And what would a trip to So-Cal be without a chance to visit the beach? As a board we spent some quality fellowship time together in Santa Monica, enjoying the sunny coast of California. From all of us on the board, we would like to extend our sincere thanks to those who are open and obedient to the Lord's prompting to participate in the work Abogar is doing for children in Latin America, in whatever capacity the Lord directs you to. Thank you!